With over 60,000 attendees, over 70 bands and DJs, Food, Wine, Cocktails, Comedy, Afterparties and more, Outside Lands Music Festival can be a lot to take in. Our friends at Radio Alice have put together the most comprehensive cheat sheet we have seen to maximize your fun at San Francisco’s Biggest festival. Check it out and get ready for one of the best weekends of the year! 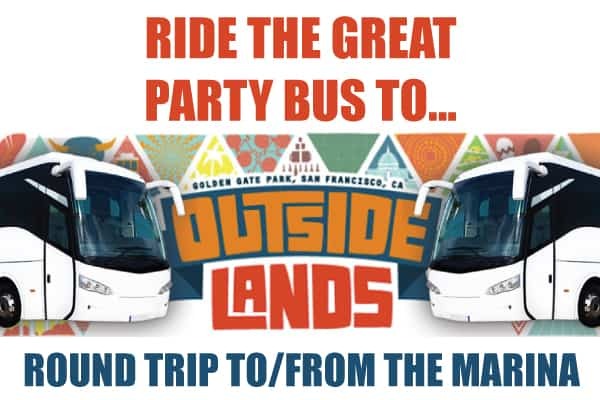 The Outside Lands 2016 Party Bus: Join the party before the party! The Outside Lands Party Bus runs from the Marina (Bar None) and Union Square (Hotel G) each day at 11AM, 1PM and 3PM and starts returning starting at 9PM. Check out the details HERE. By Public Transportation: San Francisco Muni is expected to provide additional service to Golden Gate Park on the N-Judah rail line, NX-N Express bus and 5R Fulton Rapid bus route. The regular 5-Fulton route will also be operating service to Golden Gate Park and the Outside Lands festival. By Bike: Concertgoers traveling by bike can park at either the Valet IT lot above Hellman Hollow, at the intersection of Traverse and Overlook Drive in Golden Gate Park. Cyclists can also self-park and lock their bikes along John F. Kennedy Drive from Traverse down to Stow Lake, on Martin Luther King Jr. Drive near the South Gate and in Marx Meadow, near the box office. All cyclists are reminded to bring their own bike lock. Outside Lands is not responsible for any lost or stolen bicycles parked inside Golden Gate Park. The Outside Lands Bike Party: Cyclists can join the Outside Lands Bike Party group ride departing in front of the Bill Graham Civic Auditorium each day at 12 p.m. On the return trip, the group ride will depart at 10:30 p.m. from the Log Cabin Meadow near the intersection of John F. Kennedy Drive and Stow Lake Drive. Interested riders are reminded to bring their bike lights and observe the “How We Ride” rules. By Car: Concertgoers hoping to park near the festival grounds must be aware that Guaranteed Parking is sold out and parking inside Golden Gate Park and the surrounding neighborhoods will be extremely limited. 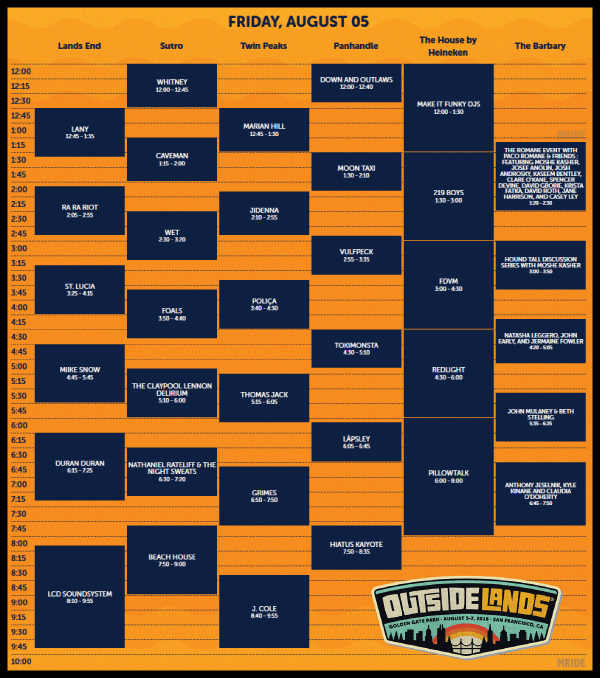 Therefore, Outside Lands strongly encourages would be drivers to consider an alternate means of transportation. Motorists should also be aware that traffic laws will be strictly enforced in and around the perimeter of Golden Gate Park. By Taxi/Ridesharing Service: Outside Lands recommends four local taxi companies, Flywheel Taxi, Luxor Cab Company, Yellow Cab and National and Veterans Cab Company. Ridesharing services Lyft and Uber also are available but prospective customer are advised to determine the actual cost of a ride before getting into the vehicle. 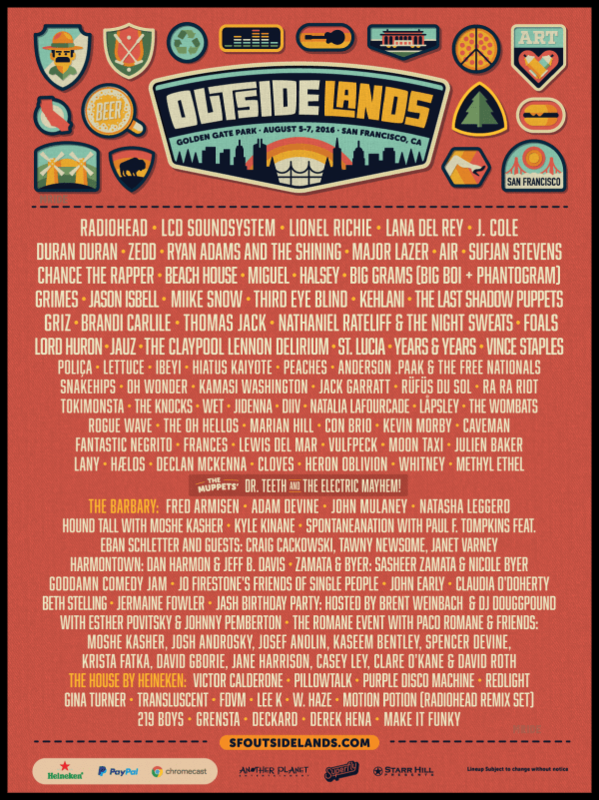 Featured Musical Acts: Among the headliners confirmed for the 2016 Outside Lands are Radiohead, Lionel Ritchie, LCD Soundsystem, J. Cole, Duran Duran, Zedd, Lana Del Rey, Ryan Adams and the Shining and Major Lazer Other notable acts include Air, Sufjan Stevens, Halsey, Grimes, Chance the Rapper, Beach House and Brandi Carlile. The three-day event will also present a number of local bands, such as Third Eye Blind, Kehlani, Con Brio, Fantastic Negrito and Heron Oblivion. In all, there will be more than 70 musical acts scheduled to appear. In addition to more than 70 musical acts at Outside Lands, several leading comedy acts will appear on the Barbary Comedy & Improv stage. Among the confirmed top name performers are former SNL cast member Fred Armisen, the star and co-creator of the Comedy Central series Workaholics Adam Devine and former SNL writer and stand up comedian John Mulaney. Other prominent comedians at this year’s festival include Natasha Leggero, Hound Tall with Moshe Kasher and Kyle Kinane. The Barbary Comedy & Improv state will be located in SoPo (south of Polo Field). No tickets will be printed or shipped. Instead, RFID-enabled wristbands take the place of tickets and will be shipped via regular mail to each ticket purchaser and will be notified via email that the order is shipped. The shipment is expected to arrive in 7-10 business days fro receipt of shipping. Each wristband comes with a unique embedded barcode chip and must be registered prior to the festival. 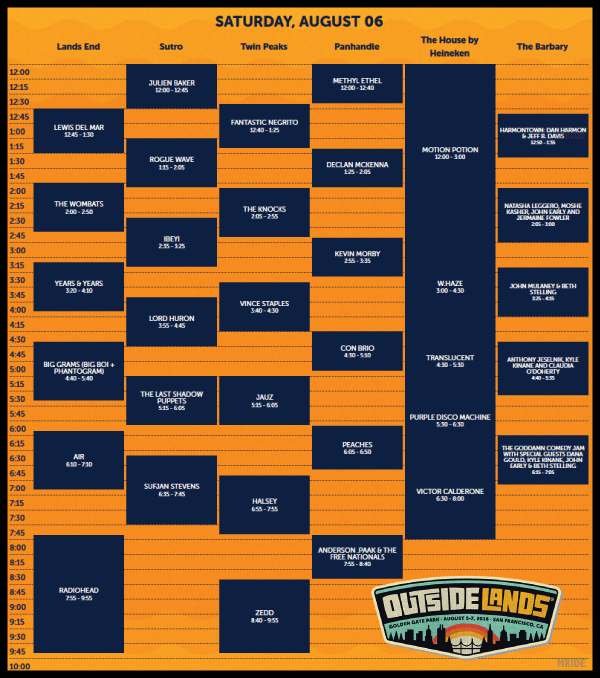 Wristbands can be registered online or through the official Outside Lands app for iOS or Android devices. Wristbands must not be put on until the day of the festival and cannot be removed for the duration of the festival. Festival attendees who wish to purchase wine at Outside Lands are advised that Wine Lands is completely cashless. The official festival wristband, which is capable of disbursing “Bison Bucks,” is the only method of payment accepted. A Wine Lands Cashless Account may be created online. Wristbands cannot be replaced if lost or stolen and aren’t intended to be transferable. If the ticket(s) was purchased outside of the U.S. the wristbands will be held at Will Call at the festival Box Office in Marx Meadow. Outside Lands will be held in much of the western half of Golden Gate Park. The event will feature five primary music stages, with the Lands End Stage located on the grounds of the Polo Field. The festival grounds are bounded by John F. Kennedy Drive to the north and Middle Drive West to the south, with the Lands End Stage near the western border and eastern side near the Twin Peaks Stage in Hellman Hollow. 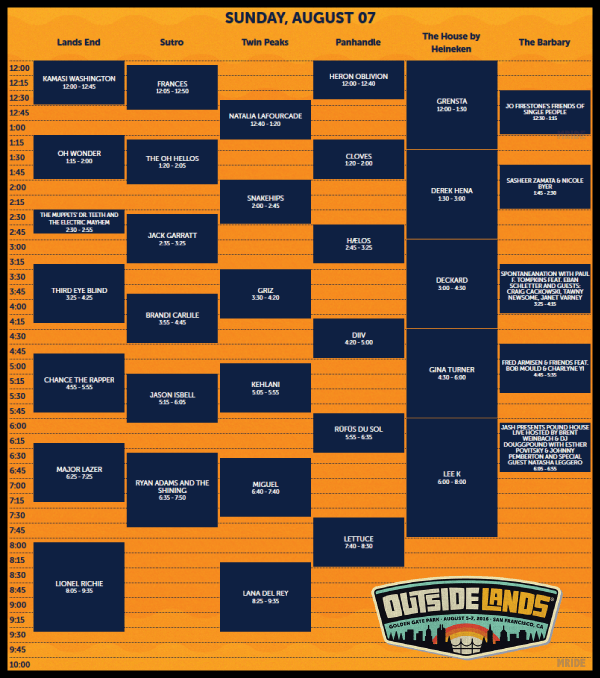 Printed program guides will be available at all entrances while supplies last but can also be found on the official Outside Lands app, which also features a festival map. The main entrance to Outside Lands will be near the intersection of John F. Kennedy Drive and 30th Avenue, near Lindley Meadow. The South Gate entrance, which is wheelchair accessible, will be located on Middle Drive West, not far from Outside Lands shuttle pick up and drop off point and the Self Parking Bike Lot on Martin Luther King Jr. Drive. The Box Office will be located in Marx Meadow, adjacent to the bike self parking area. The VIP entrance is located at John F. Kennedy Drive and 36th Avenue, with a VIP Hospitality tent set up just past the entrance. The primary Accessible Entrance is also located here but has a separate entranceway with an Access Center. Among the facilities available on the festival grounds are medical tents and services provided by Rock Medicine, ATM machines, bathroom and hand washing stations, refillable water stations, Lost and Found and locker rentals. No camping is allowed within the festival grounds or in Golden Gate Park. Additionally, all attendees are advised not to sleep in their vehicles in and around the park. Hotel accommodations may still be available at one of the two official Outside Lands hotels, Hotel Zetta, next to the Westfield San Francisco Centre and Hotel Zeppelin in Union Square. Other hotels recommended by Outside Lands are Hotel Abri in Union Square, Joie De Vivre boutique hotels, the Stanford Court on Nob Hill and Cavallo Point in Sausalito. Other suggested San Francisco hotels are the Argonaut Hotel, Hotel Zephyr, Axiom Hotel and The Metro Hotel. Nearly 80 food vendors comprised of restaurant partners, food trucks and carts, will be on hand to offer all sorts of delicious food items, including gluten-free, vegetarian and vegan options. 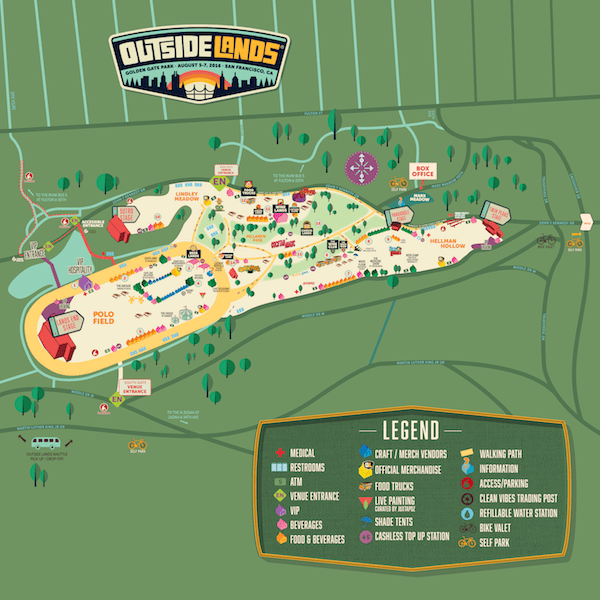 Concertgoers can refer to the 2016 Outside Lands map for the location of each respective vendor. Most food vendors will accept debit/credit cards for food purchases. However concertgoers are advised to bring cash to play it safe. Among the recommended restaurant partners to consider for tasty offerings are Earthly Delights, Nombe, Rosamunde Sausage Grill, Tacolicious, Three Twins Ice Cream and Wise Sons Jewish Deli. Among the notable food trucks and cars operating on the festival grounds are Bacon Bacon, Humphry Slocombe Ice Cream, Senor Sisig and The Chairman. Other gourmet food items can be found at Chocolands, Cheeselands and Outside Clams, near Wine Lands. Staff representing more than 40 regional wineries will be available to serve over 120 types of fine wine at Wine Lands. Among the notable participating wineries are Bluxome Street Winery, Chateau Montelena, Claypool Cellars, Preston Farm and Winery and Ridge Vineyards. All Wine Lands vendors are completely cashless and all purchases must be made with “Bison Bucks” through the official RFID-enabled wristband. Funds can be added to an account at the physical Top-up Station at Wine Lands or through the Outside Lands mobile app. More than 25 local and regional breweries will be selling all sorts of fine craft beers at Beer Land. Among the most popular brewing companies lined up for this year are 21st Amendment Brewery, Anchor Brewing Company, Drake’s Brewing, Mendocino Brewing and North Coast Brewing Company. Beer Lands will be located at the east end of the Polo Field, furthest from Lands End Stage. -Låpsley (above): 6 p.m. California Academy of Sciences, 55 Music Concourse Drive. -Marian Hill, Lex: 8:30 p.m. Rickshaw Stop, 155 Fell St.
-Polica: 8:30 p.m. The Independent, 628 Divisadero St.
-Ra Ra Riot, Caveman, DJ Aaron Axelsen: 9 p.m. Rickshaw Stop. -Years & Years: 9:30 p.m. The Independent. -Snakehips: 9:30 p.m. Mezzanine, 444 Jessie St.
-Haelos: 9:30 p.m. Rickshaw Stop. -Juaz: 9:30 p.m. The Independent. -Thomas Jack, DJ Aaron Axelsen: 9:30 p.m. Mezzanine. -Griz, Lettuce: 9:30 p.m. The Independent. This year’s Outside Lands will also feature the return of Gastro Magic for food, drink, music, magic and more, as well as Outsider Art with daily live painting and a full lineup of artwork from local artists. Other activities on the festival grounds will be the Back Wine Mini Golf Course, Castland by Google Chromecast and the Digital Detox and Camp Grounded Analog Zone. Outside Lands has a complete list of items that are either accepted or prohibited. Among the items attendees can bring in are blankets, regular sized or unframed backpacks, two sealed water bottles, binoculars and personal cameras with a detachable lens two inches or shorter. Among the prohibited items are weapons of any kind, illegal substances, skateboards, fireworks and explosives, umbrellas, selfie sticks, spray paint and large markers, pets, tents, audio and/or video equipment and professional cameras. 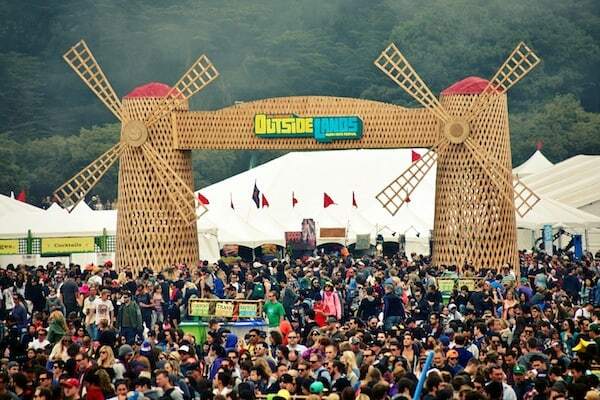 The Outside Lands Music and Arts Festival is an eco-friendly music, arts and gourmet food festival held each August in San Francisco’s Golden Gate Park. The very popular music festival sells out quickly each year and draws more than 200,000 music fans to the city’s largest and most famous park originally known in the 19th century as the “Outside Lands.” Since its inaugural event in 2008, Outside Lands has hosted a wealth of big name acts and up and coming bands representing popular music genres like alternative rock, classic rock, rap and hip hop, R&B, indie folk, country and electronica. High profile acts like Paul McCartney, Kanye West, Stevie Wonder, Dave Matthews Band, Metallica, Pearl Jam, The Black Eyed Peas, Foo Fighters, Elton John, Kendrick Lamar, Sam Smith and hundreds of others have all performed at Outside Lands.